This sophisticated men's 5 stone 1/10 carat diamond ring in 14K yellow gold from Apples of Gold Jewelry is the perfect wedding band for someone who is looking for a refined band with a hint of sparkle. 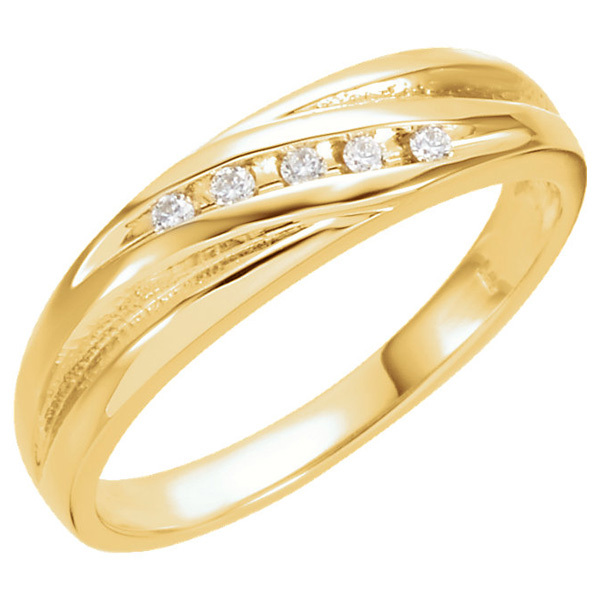 The 14K yellow gold band is 4mm wide and 1.7mm thick, an features a crossover design with five diamonds nestled into the center. The diamonds are 1/10 carat (0.10 carats total), and are G-H for color quality and SI for clarity. There is also a matching women's band available for this ring. We guarantee our Men's 5-Stone 1/10 Carat Diamond Ring, 14K Yellow Gold to be high quality, authentic jewelry, as described above.